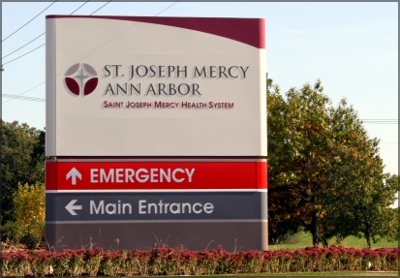 During early – mid 2011, visitors of St. Joseph Mercy Ann Arbor may have noticed the renovation of the northwest main entrance. The hospital comprised of just one house with 17 beds in 1911, it now has over 500 beds in multiple buildings on 340 acres. 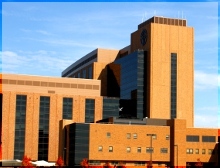 This new entrance is the latest modernization this facility has had in its 100 years of health care. Aluminum Supply Company supplied a variety of material for this project to Huron Valley Glass, located just a few miles from the hospital. The majority of the metal for this job was fairly standard .063 clear anodized channels and angles. 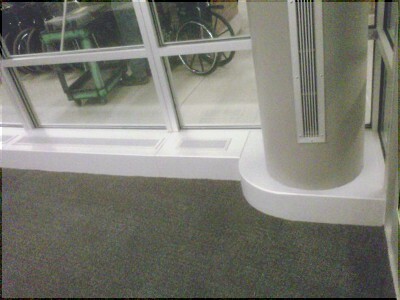 What really stood out, from a fabrication stand point, was the design of a radius stool trim(shown above, photo courtesy of Huron Valley Glass). These two irregular pieces begin to push the envelope of fabrication limits. The face piece was formed first, while the top was cut to shape. After welding the two pieces together, special care was taking to work the finish of materials so that the work would not be seen after painting.